I’ve experienced this now several times, so it’s time to expose it to other parents. When your child is with you but talking on the phone to their other parent, one tool the parent uses to lessen the value of your child’s visitation at your home is to tell them great stuff that awaits them back home. Tips to combat this pointless behavior from the parent who’s lashing out? Have a normal, fun time with your kids. At the end of every day of your visitation ask them, “What did you enjoy doing most today?” And take a few pictures and videos every day. Post them online, or somewhere that the child can see them. Make the actions memorable, which will be far more powerful than the other parent pulling down the child’s enjoyment with you using words. Is blocking a child’s love child abuse? One parent is attempting to block a child from loving the other parent. Is this child abuse? Of course it is. It’s a cruel practice that deserves prompt attention so that it stops and the effects are neutralized as much as possible through therapy. The three pillars of child abuse: Mental, Physical, and Sexual, all damage the child moderately to severely. Unfortunately, today’s “soft” courts who won’t stand up to mental child abuse allow the practice to continue largely unabated. This needs to stop. 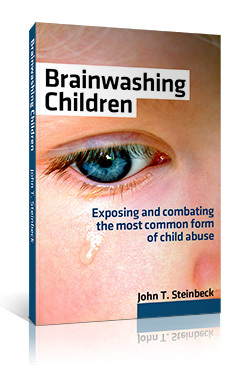 There are only a few books on mental child abuse, but hundreds on sexual abuse. That’s the reason I decided to start this blog– there’s so little information out there for parents to learn about on the topic of Brainwashing Children. One thing commonly done by a parent who wants you to have minimal contact to “their” son or daughter is to not show them cards or letters you mail. You can send postcards, a birthday card, a Valentine’s Day card, whatever. But a parent bent on harming his or her own child’s relationship with the other parent will pass those right along to the trash. Whenever you send a letter or card, remind yourself a week later to ask your son or daughter if they received it. If they didn’t then it’s time to speak to the parent. Explain how you expect letters you send to please be forwarded to the child. Don’t be angry with them, just state kindly but firmly that you would request that correspondence be shared with the child. You can also start sending your postcards or letters to the child’s school. I’ve done this for quite some time. I address the letter to the teacher, my son, and the entire 3rd grade class. I’m sending them from different countries, so it provides a source of learning and entertainment for everyone. If you’re in the same city all the time this won’t work quite as well, but you get the idea. Explain to the teacher what’s going on, and he or she will be more than happy to field a few letters or postcards. If that doesn’t work, then it’s time to air your grievance in front of a judge. Contact your lawyer. Your ex has many tools at his or her disposal to push you away from and out of your child’s life. One of the small but telling ways is to deny any pictures of you in your kid’s room at your ex’s. Why would they do this? Your ex is making a pointed attempt to keep the child from thinking of you. Looking at a picture instills warm feelings towards that person, but your ex does not want the child to feel these feelings towards you. Think about how tragic this is. The parent is deliberately taking away a memory of the other parent from the child. While it may seem on the surface like it’s not that big of a deal, it actually is. If your kid has other pics in his room (and you can be sure the other parent is in one or more of them), but you’re not in any of them, you can be sure your ex is up to this sad and subtle brainwashing technique. Not allowing pics of you anywhere is ywr another tool for bitter ex’s to help pass their dislike or even hatred of you — despite your being one of the two top people of importance in their life– onto the child.